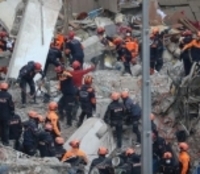 Minister of Interior Süleyman Soylu, Minister of Environment and Urbanization Murat Kurum, Governor of İstanbul Ali Yerlikaya and Disaster and Emergency Management Authority (AFAD) Chair Mehmet Güllüoğlu made statements about the collapsed building in the district of Kartal in İstanbul yesterday (February 10). Minister Soylu stated that 34 residents were in the building when the incident happened and added that glass maker Volkan Balta was also in the building during the collapse. Regarding the number of casualties, Soylu said, "Our friends rescued 14 wounded from the debris. It was unfortunately not possible to rescue 21 people alive, we have lost them despite our all efforts." Soylu also stated that they were estimating that 35 people were under the debris, adding that as of February 10, they reached all of the 35 people. Sharing information about the investigation launched into the incident as well, Soylu said that the investigation has been jointly conducted by the İstanbul Anatolian Chief Public Prosecutor's Office, Ministry of Environment and Urbanization and the Inspection Board of the Ministry of Interior. "What is necessary will be done about who is at fault here. When legal and administrative processes bear results, they will be shared with the public," Minister of Interior Süleyman Soylu stated. Sharing details about the construction of the building and its structure, Minister Kurum said that the quality of the concrete used in the building was far below the standards. Kurum added, "When we examine the visible concrete grade, we encounter a concrete state which was made of sea sand containing seashells and where no ribbed irons were used." Regarding the license of the building, Murat Kurum stated that while five storeys and the ground floor of the building were licensed, there were seven storeys and one ground floor in total in the building when it collapsed, indicating that its two storeys were without a license.